Until the 18th century children were regarded as possessions of their parents and as such parents had the right to treat them as they wished. Indeed, legislation was introduced to protect animals before children! It was not until after World War II that child abuse was acknowledged there was recognition that children needed protection. Society was slow to accept that carers could deliberately harm children they were responsible for. It was not until the 1970s that physical abuse was recognised as a common occurrence and a pathway for its management was introduced. It took another 10 years for the problem of sexual abuse to be highlighted. Many lessons, unfortunately, have been learnt from tragedies leading to public enquiries, local case reviews and research. (2) The recognition and management of child abuse has improved significantly over the last 50 years however the development of systems to safeguard children is an ongoing process. The true prevalence of child abuse is difficult to determine largely due to differing perceptions as to what constitutes child abuse and the research method used. What defines the definition of child abuse changes over time, within societies and even within families. Data studies rely on child abuse being identified and reported by professionals. 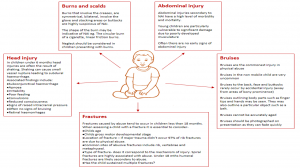 Many risk factors have been identified that place children at higher risk for maltreatment. It is important to remember that although certain factors relating to the child places them at higher risk the child is the victim and should never be blamed for any maltreatment. Historically ‘the battered baby’ where physical injuries inflicted on the child by an adult was considered child abuse. Now it is recognised that child abuse can be categorised into four separate areas- physical abuse, emotional abuse, sexual abuse and neglect. 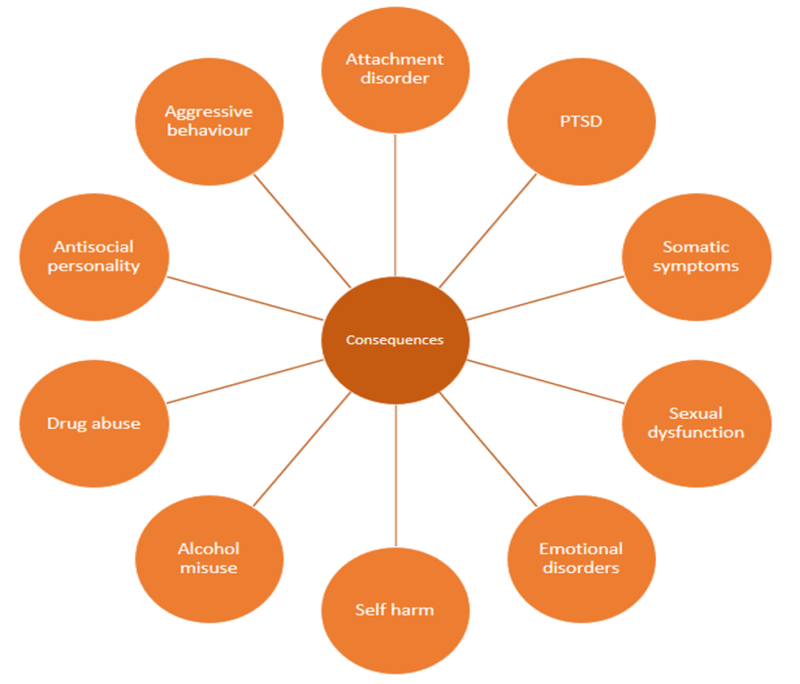 Often children present with one form of abuse, however it is likely that they are also suffering from a combination of several forms. Young children, especially those under 2 years, are at highest risk of physical abuse. 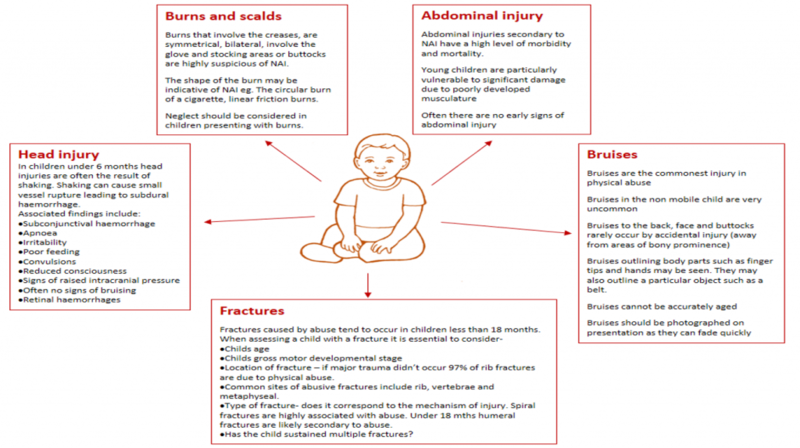 Although the majority of injuries sustained are accidental, a careful history and full examination must be undertaken in all children to differentiate from those which are deliberately inflicted. The parents reaction was not appropriate to the situation – too concerned, aggressive, elusive, vague. Neglect is the commonest form of child abuse and the most common reason for a Child Protection Plan. It can be argued that neglect plays a part in all forms of child abuse. 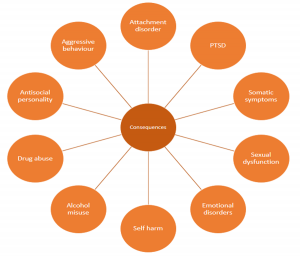 Neglect has the potential to be life-threatening and should be considered as severe as all other forms of abuse. However, it is important to recognise neglect may be unintentional. Although neglect is often associated with poverty it also occurs in affluent families. The effects of neglect appear to be cumulative and long lasting. It can affect the child physically (inadequate supervision, nutrition and healthcare), emotionally and socially. Neglect needs to be recognised early to limit long term effects. Emotional abuse, which also includes emotional neglect, is the hardest form of abuse to identify and evidence, however it is no less harmful to the child than the other categories of abuse. It is imperative that parent-child interactions are observed and documented in a variety of environments in order to fully assess and evidence potential abuse. Although sexual abuse is managed by paediatricians with specific training any clinician working with children needs to be able to recognise signs of sexual abuse and know what to do. Any suspicion of sexual abuse must be acted upon. Doctors should have a low threshold for suspected child abuse. If you are unhappy with the advice given consult further – go up a level of seniority or contact the named doctor/nurse for safe guarding. Despite much being learnt from case reviews and research and current policies constantly being critiqued and updated unfortunately not all incidents can be prevented. There are four areas recognised where professional practice can be improved. Child abuse may go unrecognised if the professional is not looking for it, they lack the clinical skills and experience or it is an unusual presentation. Often a number of different professional teams are involved with families where children are at risk. Failure to communicate between the teams is a common reason for why child protection cases are missed or poorly managed. All referrals to a different team regarding child protection concerns must be followed up in writing. Different teams use different jargon which can further complicate communication. Reports should not contain jargon and test results should be explained. All health professionals working with children should be aware of and adhere to local child protection procedures to ensure children are efficiently and effectively managed. It is essential all notes are documented correctly – date, time, patient details, clinicians details and clinicians signature should be present on all pages. Aged 8, Victoria Climbié was taken from the Ivory Coast to live with her Aunt and her partner in London. Within a year Victoria was known to the police, social services, two hospitals the NSPCC and local churches, all of which had noted signs of abuse. All failed to fully investigate or act on their concerns. This failure by multiple agencies over a 10 month period contributed to Victoria’s death on 25 February 2000. Her post mortem recorded 128 separate physical injuries. The subsequent report made many recommendations and was the main initiator of the formation of the Every Child Matters Initiative and the introduction of the Children Act 2004 amongst others. Peter Connelley (Baby P) died in 2007 aged 17 months. His body was discovered in a blood stained cot with over severe 50 injuries including a broken back and rib fractures. Peters’ carers were convicted of causing or allowing his death. This tragic death occurred despite Peter being on the Child Protection Register and having been seen 60 times over eight months by police, health professionals and social workers. An independent review into Peter’s death concluded that child protection services were found to be exceptionally “inadequate” with a further serious case review reporting that child protection staff should have been able to stop the abuse “at the first serious incident”. The death of Peter Connelley sparked major reforms and reviews of child protection procedures in the UK. The death of baby P attracted considerable media coverage of child protection and social work in England, much of it negative, and some of it targeted individual healthcare workers. Interestingly, when the Sun newspaper published its article ‘Blood on their hands’, it was not referring to those who had caused harm to Peter, but to the professionals, predominantly the social workers involved. The media attention surrounding this case is considered significant and responsible for what is known as the ‘Baby P effect; – the marked decline in morale and problems in recruiting and retaining staff involved in fronline child protection whilst increasing communication of child protection concerns by the public and partner agencies. All doctors should undertake regular child protection training. All doctors should feel they are competent to recognise and respond to child protection concerns. Doctors should understand their role and in addition have awareness of the roles of the other members of the interdisciplinary team. (4) Child protection companion 2013. RCPCH. (5) Yvonne H Carter Lessons from the past, learning for the future: safeguarding children in primary care BJGP 2007; 57 (536): 238-242. (6) Yvonne H Carter Lessons from the past, learning for the future: safeguarding children in primary care BJGP 2007; 57 (536): 238-242. Which of the following is NOT a form of child abuse? Which of the following is a risk factor of a child for child abuse? How may a child experiencing sexual abuse present? What should you do if you have concerns over child abuse? Which of the following is a child factor that puts them at higher risk for maltreatment? Which age range are at highest risk of physical abuse? What investigations should be done on an under 2 where physical abuse is suspected? Which of the following is not a presentation for medical neglect? What should you do when responding to a disclosure of abuse? When note keeping where should the patient details be noted?